Agility is a dog sport that is pure fun for the owner and as well for the dog. Hmmm…or should we say it’s the other way around? Agility is a sport in which a handler directs a dog through an obstacle course in a race for both time and accuracy. The handler can give directions to the dog while walking the trail, this can be verbally or by signalling the dog. The dog and the obstacles can’t be touched by the handler. Essential with this sport is that the dog learns to respond promptly and correctly to voice commands and body signals from the handler. It is therefore essential that you have your dog under control without being on a leash. Agility uses a lot of obstacles that challenge the various skills of the dog. Both the dog and the handler are physically challenged, all the muscles of the dog are trained. Besides that, the dog becomes more self-conscious and the bond between the dog and the handler will be strengthened. This form of sport is also optimal for the socialization of our American Staffordshire. As well in addition of this all, senses, memory and concentration of the dog are stimulated. For the spectator, agility is spectacular to watch even it seems a very simple sport. To see an advanced team of handler and dog walking has taken for sure many hours, if not years, training for both handler and dog. The origin of Agility comes from England and originates from the equestrian sport. It was introduced in the Netherlands in 1978. 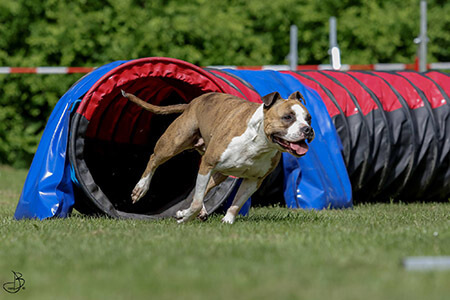 The main difference is that with agility our AmStaff has to jump over obstacles, to run through tunnels, and to manoeuvre between poles. 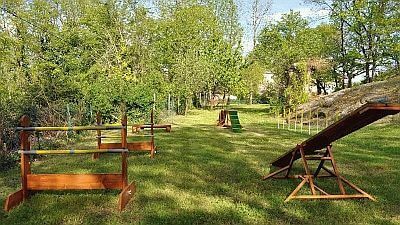 These devices are repeatedly placed in a different order, so it’s essential that the dog is guided properly so that the dog can take these obstacles in the prescribed order and this without any mistakes. No other form of dog sports combines work and training with the dog in such a positive, enjoyable way as agility. The FCI (Fédération Cynologique Internationale) now recognizes agility as an official sport. In the Netherlands, the “Raad van Beheer” rules this specific sport. 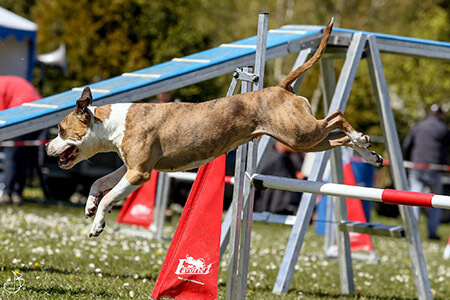 Agility is currently the fastest growing form of dog sports. Practically all dog associations and dog schools provide courses for the recreational, novice and advanced competitor. According to a recent census, this sport is already practiced in over 52 countries. In principle, every healthy American Staffordshire Terrier can do agility. Of course, there are dogs such as for example the Border Collie, which by their specific breed features have a natural advantage. But despite this all, it remains a beautiful sight for me to see our AmStaff at a fast pace taking all these obstacles. In my opinion, their strength, athletic ability and “drive” are unmatched. Agility can be started when the dog is mature. Normally, an AmStaff is advised not to practice agility before it is 18 months old, and in some cases even an age of at least 24 months is recommended. This is depending on the AmStaff type you have. If we are talking about a heavy boned dog, we recommend using the 24 months as a guideline. Of course, you can start to make a puppy feel comfortable with the equipment at an early age. With Agility, the health of the dog and, the safety on the track and the equipment safety is one off the most important things. Top level agility can certainly be compared to, for example, top level athletics. 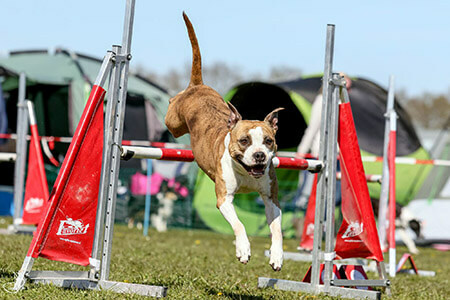 Even if agility is only exercised recreationally, the dog owner must take certain measures to keep the chance of injuries as small as possible. Taking the obstacles requires a lot of the dog, especially the fence and the poles are stressful devices. If these conditions are met, handler and dog as a combination can enjoy this sport for years and years. At the novice training, the most important is that the dog gets to know all the devices and obstacles. Then the advanced course follows. This to refine the techniques further, usually more focused on the handler than on the dog! The handler must also train, he or she, must be thought to give the dog the right command at the right time, and must always be in a good position at the track. The training is aimed to increase the skills of the dog and his handler and to further improve the bond between these two until eventually a “real” team is on the track. With agility – like any other sport – time, patience and especially fun are the most important ingredients to get the best results. 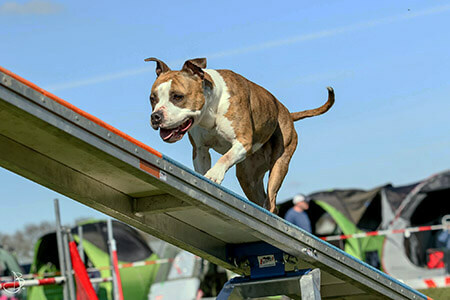 Thousands of people and dogs practice Agility in the Netherlands. National and regional competitions are being organized all the time. There are competitions where can be scored for promotion points in various classes. In the highest class, they compete to be elected to compete in the world championships and obviously they compete for the Dutch championship title as well. Besides this competition there are still a number of “special” competitions such as team matches, an indoor winter competition and individual races of various race clubs. Attention! Agility will be very addictive. Before you know, you have an obstacle run in your backyard and you are training your American Staffordshire terrier every weekend! Undoubtedly, your American Staffordshire Terrier will be grateful to you forever!